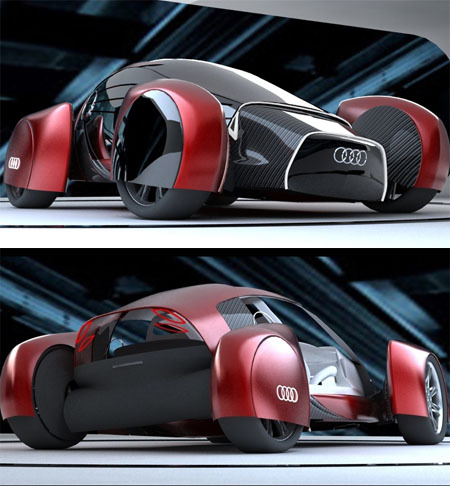 The Audi A0 QS, Q stands for four-wheel drive and S for sports, has been specially designed for athletes and rich people to enhance their active lifestyles. This small and dynamic sports car is equipped with electric motor and a hydrogen engine that make the car entirely hybrid. Additionally, it features a special rotation system of the wheels with an analogy of the three-wheeled trike, making the wheels able to bend without rotation along the vertical axis. Rubber fabric has been used to make the doors, which greatly enhances the design and makes it possible to transform into transparent materials according to the rider’s need. Length of the compact car is 3400 mm, giving the users an ultimate driving convenience on busy urban roads and when parking.